Final Score: 81 points, or very good to excellent on my rating scale. 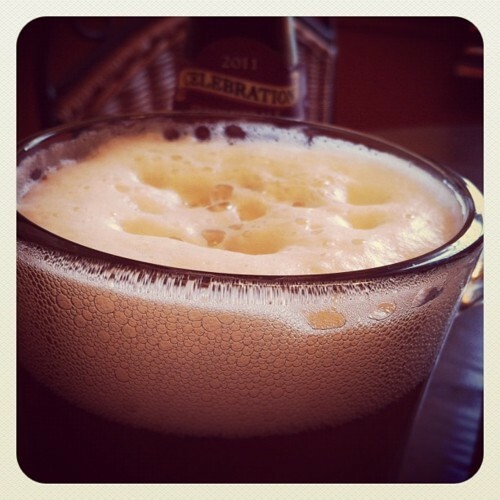 The other night, I was drinking the 2011 version of Celebration and something caught my taste buds: the first few sips reminded me very much of Dogfish Head’s 60 Minute IPA, which I reviewed here, only a bit less refined and more harsh. 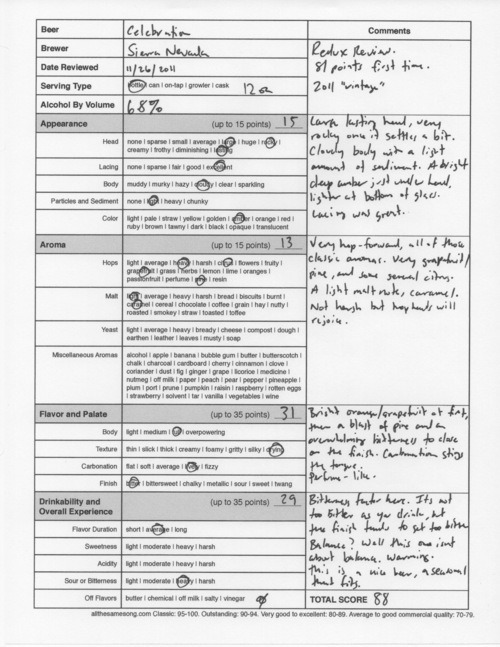 But what stood out to me was that the Dogfish creation had been awarded 95 points, leaving a 14 point gap between it and Celebration. Something wasn’t quite right here. No way should 14 points separate these two beers. Welcome to the very first Redux Review, where I will revisit beers I have already put through a regular review. 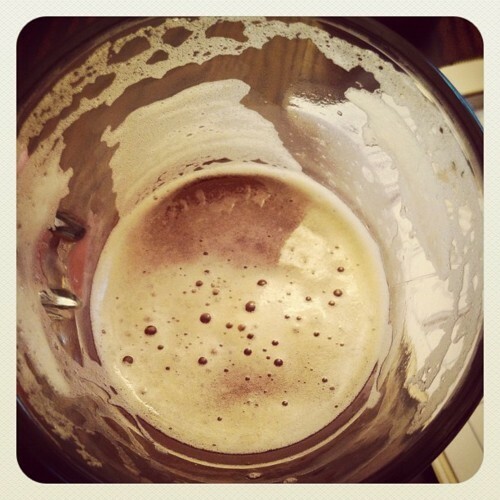 We’ll see if anything has changed — with the beer or with me — since the last time I tasted a particular brew. First, a little detective work. What could make this beer different now than it was just under a year ago? 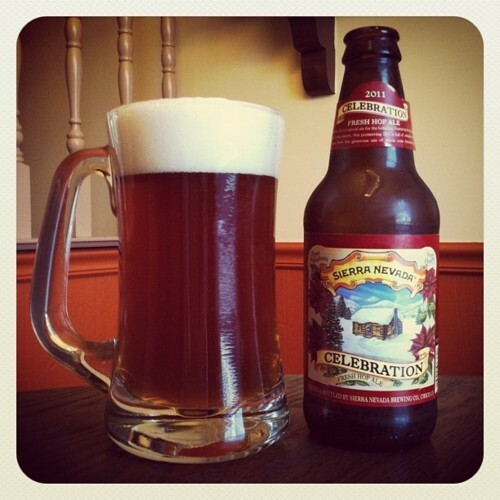 Well, Celebration Ale is dated on the bottle — on the neck, Sierra Nevada prints the year of release, like a wine vintage. Last year’s bottle would have, of course, been last year’s batch. But does it make that much of a difference? I did note in my first review that the company does state that this beer may change slightly from year to year. As far as age, this isn’t really a beer you’d want to store for long periods. The ABV (alcohol by volume) is only 6.8%, and typically aging works for beers around 9% or higher. This Redux Review will be of a 2011 bottle, so let me make that clear. I have not aged a bottle of this — so this beer may, in fact, be slightly different than what I reviewed last year. The pour made for a large, long lasting head that was rocky in texture, set beautifully contrasted against a deep amber drink that got lighter as you looked toward the bottom of the glass. The body had a light amount of sediment floating throughout, and the lacing left behind was of fine quantity and quality. One interesting thing I observed about the appearance was how there was almost a black line drawn between the head and the actual beer. This “black line,” a heavy contrast between the bright white head and dark amber of the drink, hung around until the head dissipated about halfway. I’ve seen beers do this before, but never that dramatically. The aromatics, as expected, were very hop forward with some classic scents of citrus and pine, especially grapefruit. While very heavy, I wouldn’t describe it as harsh, and there was a small attempt at balance with a very light caramel note. Hop lovers will definitely rejoice here. The hops are really crisp; so crisp, it is reminiscent of spearmint chewing gum. On the taste, the palate is first hit with an orange and grapefruit blast that transitions into a heavy Christmas-tree like pine, before finishing with bitter grapefruit and orange rind that gets harsher as it lingers on. The carbonation of the beer stings the tongue, which gives the impression that this beer is so hop-forward that it might be wrestling with your kisser. It’s a neat feeling that fits this beer like a glove. 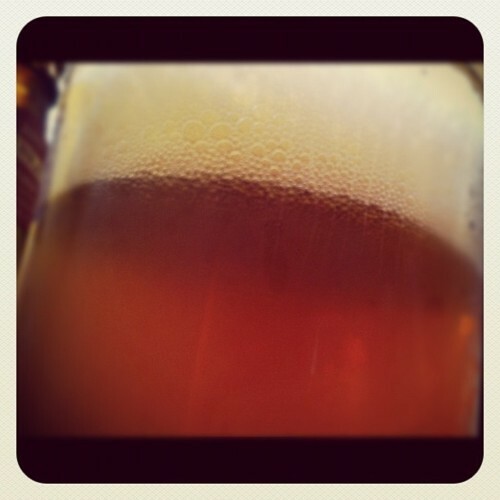 The overall quality in terms of mouthfeel is dry, and as the finish nears a close, you’re reminded of a gentle perfume. This is a very interesting beer. In terms of hops, you aren’t going to get much better than this. It’s sharp and arresting, and the flavors are bright. But the finish borders on too bitter, and that would probably turn away the more casual drinker. I like the occasional hop blast but I couldn’t see myself drinking more than a couple of these at a time. And the seasonal aspect? Hammer nailed. 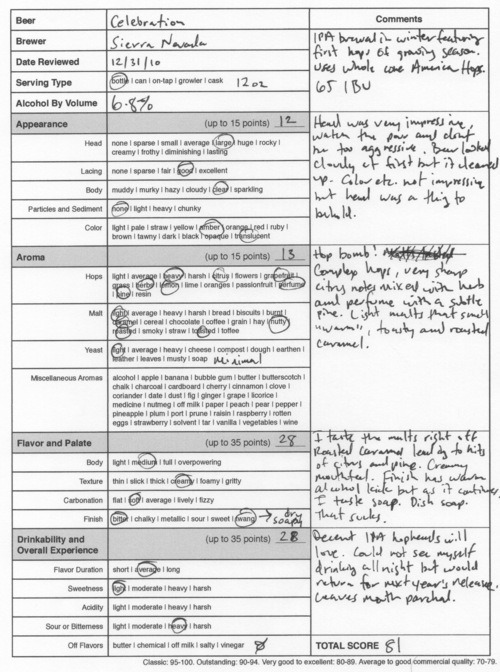 The warming effect, despite the higher than average but still somewhat low ABV, is spot on. Sierra Nevada Celebration, redux score of 88 points. Price: $14.99 US for a twelve pack.